"The attached photo was taken in the 1880's at Spirit Lake. 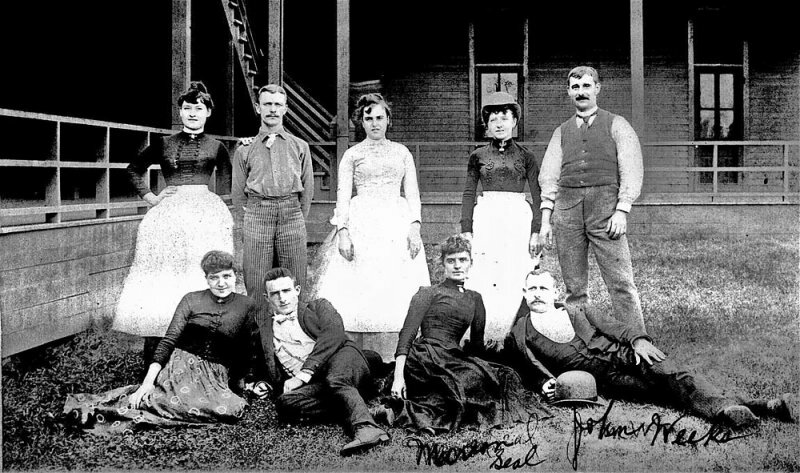 My Great Grandparents are in the photo and appear to be employees. much in the photo in the way of clues." I agree with David Maxwell that it is the West Side Hotel -- the porch railings are definitive. Those at the Hotel Orleans were of a different and more ornate design. In fact, I would love to see MORE photos of the West Side Hotel. Wasn't there also an old "Orleans Hotel"(?) that burned down at some point? It could be the West Side Hotel on the south shore of Spirit Lake. My ancestor Charles A Arnold purchased it in 1882 and ran it for many years.